View More In Racking & Storage. 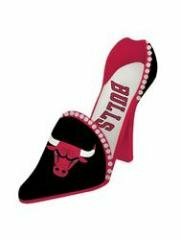 So feminine and so chic, our shoe bottle holder is handpainted polystone in your team's colors. Embossed and handpainted logos with rhinestone accents, this shoe will be the talk of any next gameday party. 4" x 11" x 8" in size.